An erosional remnant in sedimentary rock, in a stable, arch-shape, rising above the basic rock layers, as opposed to a "Natural Bridge". Camping and photo tour of geologic formations in the Arch Rock area of Joshua Tree National Park. Geology tour of White Tank Arch Rock in Joshua Tree National Park. The Arch. Geological processes have created the arch over time. But in a geological framework, its existance is only for a moment and not a final product. Pictures of arch rock in Valley of Fire State Park, Nevada. 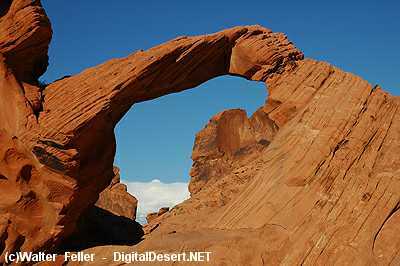 Arches are arch-shaped landforms produced by weathering and differential erosion. Natural bridges are a naturally created arch formation resembling a bridge. Photo tour of White Tank Natural Arch - joshua tree national park, mojave desert. The geology of Echo Canyon/Arches, Furnace Creek Wash, Death Valley regional field guide. Photo tour of Natural Arches in the Devil's Punchbowl.